Did you know there's something like twelve different types of power sockets in common use around the world? Unsurprisingly, that's not very useful for international travelers. To get around this (completely-avoidable) problem, an entire industry of travel adapter manufacturers have sprung up to let frustrated vacationers charge their iPhones and laptops without a problem. Not all adapters are made equal, however, and there are a few things you should know before buying one for that big overseas trip. Probably the most important thing for North Americans to remember when buying a travel adapter is that it will likely only convert the layout of the pins on your charger or appliance, not the voltage coming out of the power socket. Why does that matter? Outside North and Central America, the Caribbean and a few other countries, mains voltage is 220-240 volts, which is around double what's used back home. If your gear can't handle the voltage change, the end result is likely a burning smell and a non-working appliance. Most portable electronics have a small sticker, either on the charger or the device itself, which lists the range of voltages they can handle. If it doesn't go up to 240 volts, you'll need to take a voltage converter as well. Travel adapters come in many shapes and sizes, from small and simple single-region adapters to larger "universal" versions that cover most countries on the planet. While the universal ones are convenient if you're going all over the world, their extra size causes two problems. Firstly, they tend to fall out of the socket–especially if there's any weight on them (like a heavy plug pack) or the socket is loose-fitting to start with. Secondly, the wider they are, the greater the chance they'll block the socket beside them as well. Take the smallest adapter, or set of adapters, you can find that will work in all of your intended destinations. Added bonus: those single-region versions are often cheaper as well. In a very odd design choice, many travel adapters only have sockets for two-pin North American plugs. If you use a MacBook, power strip, or other devices with the round earth pin, it just won't fit in that kind of adapter. Make sure you know what you intend to plug into your adapter before you buy it, or just avoid the problem and buy a three-pin version regardless. Just like food, drink, Internet access, and almost anything else you can think of, the airport is one of the most expensive places to buy travel accessories. It's not unusual to see travel adapters worth five bucks selling for well over twenty dollars in airport gift stores, just waiting for the unfortunate person who forgot they needed one until an hour before their plane leaves. Don't be that person. Buying your adapter ahead of time saves you money, lets you pick the exact version you need, and depending on the type, gives you the chance to test it before you leave. If you're traveling with a family, or just a whole bunch of gadgets and appliances, buying individual adapters for them is an expensive exercise. Fortunately, you don't have to. Instead, buy a travel power strip (or in a pinch, just pack one you've got lying around at home). As long as they don't need their voltages converted, just plug all of your chargers into the power strip, the power strip into the travel adapter, and the adapter into the wall. 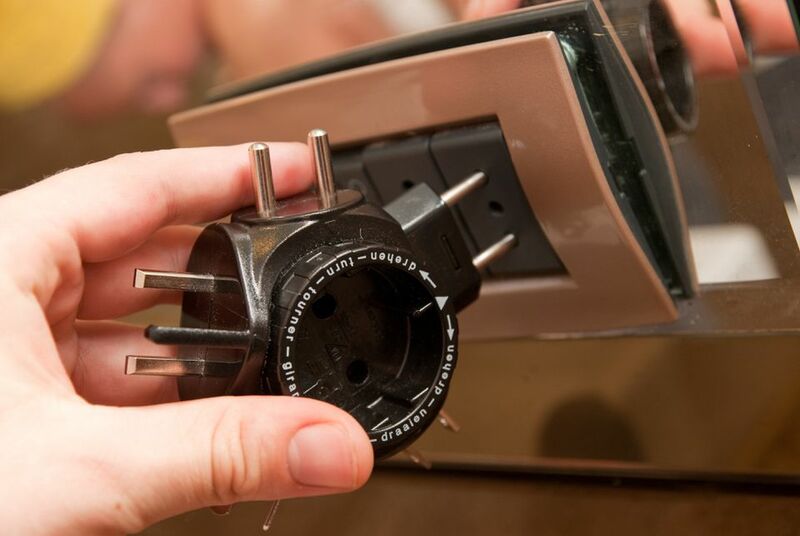 This approach has several advantages–it saves you money, gives you extra space in your bag, and gets around the problem of never, ever having enough power sockets in your hotel room. If all of your electronics can charge via USB, you've got another, better option. Several companies make compact two or four-socket USB travel adapters, that will let you charge multiple gadgets from the same wall socket. The better ones have clip-on plugs that let you use them in many different countries. Phones, tablets, Kindles, portable batteries, even some electric toothbrushes can all be powered from the same little adapter. Before buying one, just remember to check the adapter's maximum power output, both for individual sockets and the adapter as a whole. iPads and recent smartphones require more juice than older phones and other small devices, so look for at least 2.4amps from each socket you plan to plug higher-powered gadgets into. Is the Skross World Adapter the Best Travel Adapter You Can Buy?